it’s no mistake that I use the words ‘comply’ and ‘forced’ because thats exactly what it is. Claimants have absolutely no choice but to comply with often unreasonable demands made from the DWP. They are forced to attend DWP regulated courses, attend the Jobcentre whenever it is demanded of them , wait more than the official five weeks for their first Universal Credit payment. They are forced into a life of poverty, many for the first time. It really is an inhumane system and it needs to stop now. 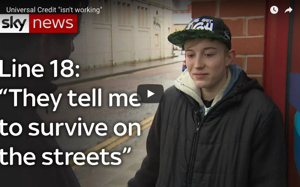 I shall list the differing problems that we addressed whilst speaking to people outside the Jobcentre, everyone that we spoke to were given advice, a survival guide, signposted and if needed a food parcel issued. Sadly the food parcels were very popular and all were gone within five minutes. I arrived ten minutes early and there was already a queue. I also took a woman to the shop next to the Jobcentre to buy her some food because we had run out. it’s awful. Universal credit payments (if you are lucky enough to receive one) are not enough to enable people to survive for a month. Most of the people that I speak to have deductions taken out of their payment for the loan that they have been forced to take whilst awaiting for their claim to be processed. Add to this other DWP loan repayments, rent top up and other debts its nearly impossible to survive. Roy spoke to a man that said he has just been rehoused into a flat. Although he’s very grateful to have a roof over his head, he told Roy that the flat is inhabitiable. Various problems with the state of the flat and a concrete floor that he can’t afford to carpet. Roy signposted him to a local organisation that might be able to help with this. We spoke to a woman that had been told that she had been migrated over to Universal Credit without her knowledge. She’s worried how she will survive. Would it not be too much to ask that the DWP inform all claimants at least a few weeks before they are transferred over? Apparently it is. I noticed a man walking in and out of the Jobcentre for what appeared to be every five minutes. He was obviously agitated and fed up and clearly didn’t want to talk. my heart went out to him, a man totally degraded and humiliated by a system that clearly cares nothing for him. I spoke to a young woman leaving the Jobcentre with her partner and children, she looked frustrated, fed up and angry. I ran over to her and asked her if I could help her with anything. She went on to say that she had been locked out out of her Universal Jobmatch account, she wasn’t certain if she had forgotten her password or if the system was at fault. Honestly it’s hard to tell at times because the system drives you to distraction. She had visited the Jobcentre to find out if she could get any help with this, but was faced with a big unanimous no. No they couldn’t help, they wouldn’t help but nevermind here’s a telephone number, phone them up and then make an appointment with an advisor to get the code. Yes you read that correctly. This is another case of DWP burocracy gone mad. Why oh why couldn’t she be given a quick and easy solution to this? An email or a telephone appointment? Nope that’s too easy, so she has left to attempt to make a lengthy telephone call, most likely be sent on a wild goose chase through different departments, wait a while for her appointment and then hopefully, and I say hopefully receive her login code. Oh and by the way because she can’t access her account she also runs the risk of being sanctioned for not complying. The longer she is forced to wait for her code the higher the risk of this happening. It’s almost as if they want this to happen isn’t it……. 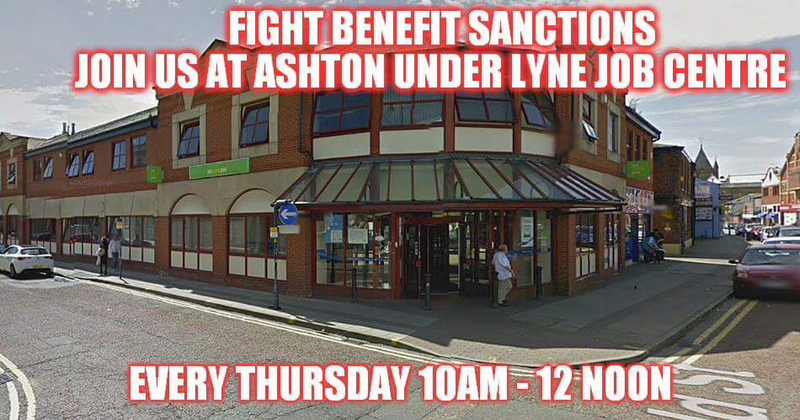 More people were walking into and out of the Jobcentre with their eyes to the ground. Not wanting to be noticed, not wanting to be there. They could of course be doing something more productive rather than being told things like they ‘must try harder to find work’ ‘Their efforts aren’t good enough” etc etc. You get the jist. I spoke to an older woman that unofficially cares for her son. He’s 46 years old, had to finish work because of a heart condition which is aggravated by stress. Instead of being able to heal he’s forced to comply with a system that is extremely complicated. She told me that he had been confused with the computer system because no one had taken the time to correctly explain the procedure of handing in fitnotes and uploading them online onto his journal. He incorrectly was in the belief that it would be enough to just upload them to his Universal credit account online, he didn’t realise because he hadn’t been instructed correctly. As a result his payments were delayed and he waited five months for his first payment. Yes an unwell man was forced to wait five months. Luckily his mother had helped him but this has put a fair amount of stress on their relationship. “ I shouldn’t have had to look after him, I’m a pensioner, but if he didn’t have me he might not have survived”. Correct, this a terrible reality for thousands of people. I spoke to a man as he was leaving the Jobcentre. He was clutching a piece of paper and was clearly stressed. I stopped him and asked if I could help. Whilst attending his appointment he was informed that he had to attend an interview for a course in an area that is quite a distance away from his home, indeed it isn’t even in Tameside. Walking would take a few hours and public transport is both expensive and complicated, there’s no straight route there. The journey would entail a tram journey into Manchester then a tram journey back out of Manchester and THEN a long walk. Whilst some reading this might be under the impression that this is reasonable it clearly isn’t. He doesn’t have the money upfront to pay for the tram journey. He might be able to get this refunded but he has to pay upfront first. I did advise him to ask for help from the Jobcentre regarding this. However his words were heartbreaking. “They are expecting me to do this for four weeks. I don’t know how I will get there, how I will be able to get there that early in the morning it seems impossible. We don’t all have cars and I don’t know what to do, so I will have to accept a sanction because I can’t do it. I’ll try but it’s going to be very hard”. Another case of unreasonable demands on a poverty stricken person. To be honest it makes me feel sick, they are setting vulnerable people up to fail and they know it. But hey, anything to lower the unemployment figures eh…. This weeks problems are not unusual they are commonplace, this is replicated up and down the country and there is no doubt at all that thousands of people are being forced to suffer needlessly. I say needlessly because there is no real excuse for treating people like this. The government have made a conscious decision to do so and in my eyes they’ve got blood on their hands. Many thanks to everyone that came along to help. It’s been a very stressful week for myself and your support and solidarity has kept me going. A huge thank you to my online friends and supporters, and also thank you to my friends in my local Labour Party, like I said its been a tough week and you ALL keep me going. A massive thanks also to the readers of my blog and the supporters of my blog. I can’t thank you enough. Please read, share, rt and email my blog. We can’t allow this suffering to continue for much longer, it’s horrific. Your posts leave me angry and horribly sad too. Thank you for doing what you do. And thank you for recording it all – hopefully at some time in the future the people who put these awful systems in place will have to answer for their actions. Thanks for keeping up your good work. I’m down south, or otherwise I would come and join you. Yet even now there is no call from Labour for Universal Credit to be scrapped. They should be campaigning to have the roll-out stopped, before there is any more suffering.